Polyols or sugar alcohols are low-caloric, sugar-free, alternative sweeteners used to replace traditional sweeteners. Arabitol or arabinitol or lyxitol is a sugar alcohol. It can be formed by the reduction of either arabinose or lyxose. CH2OH(CHOH)3CH2OH a sweet, colorless crystalline material present in D and L forms; soluble in water; melts at 103C. Also known as arabite. CAS nummer 2152-56-9. Erythritol C4H10O4 122.12 g mol−1Density 1.45 g/cm Melting point 121 C. Boiling point 329-331 C.
Erythritol is a natural sugar alcohol, which has been approved for use throughout much of the world. It occurs naturally in fruits and fermented foods. At industrial level, it is produced from glucose by fermentation with a yeast, Moniliella pollinis. It is 6070% as sweet as table sugar and almost non-caloric. Glucemic index is zero and it does not cause tooth decay. It is absorbed in the small intestine and then for the most part excreted unchanged in the urine. Therefore does not cause gastric side effects unlike other sugar alcohols. According to FDA labeling requirements, it has a caloric value of 0.2 calories per gram . In the European Union regulations currently label it and all other sugar alcohols at 2.4 kcal/g. As a whole, erythritol is generally free of side-effects in regular use. Erythritol has a strong cooling effect (positive heat of solution) very similar to that of xylitol when it dissolves in water. Erythritol has been certified as tooth-friendly. The sugar alcohol cannot be metabolized by oral bacteria, and so does not contribute to tooth decay. Interestingly, erythritol exhibits some, but not all, of xylitol's tendency to "starve" harmful bacteria. Glycerol. Glycerol or glycerine forms the backbone of fat (triglycerides), it is produced on saponification or transesterification. In foods and beverages, glycerol serves as a humectant, solvent and sweetener, and as a thickening agent. As a sugar substitute, it is 60 percent as sweet as sucrose. Although it has about the same food energy as table sugar, it is non-glycemic and non-cariogenic. HSH Hydrogenated starch hydrolysates (HSH), - polyglycitol syrups - are found in a variety of foods. They serve as bulk sweeteners, viscosity or bodying agents, humectants (moisture retaining ingredient), crystallization modifiers etc. just like sorbitol. HSH and sorbitol are made the same way, but from starch hydrolysates of different Dextrose Equivalent (DE) and different composition. Sorbitol is the result of hydrogenation of dextrose or starch syrup with a high DE equivalent to pure dextrose, while a hydrogenation of low DE hydrolysate will lead to a mixture of sorbitol, maltitol, and longer chain hydrogenated saccharides (maltitritol a.o.) With no single dominant polyol the generic name Hydrogenated Starch Hydrolysate is used. If 50% or more of the polyols are of one type, it can be labelled as "sorbitol syrup", or "maltitol syrup", etc. A special variety is manufactured by hydrogenation of the mother liqueur (hydrol) after first dextrose monohydrate crystallization. Hydrogenated starch hydrolysates are 20% to 50% as sweet as sugar depending on its particular composition. The HSH family of polyols is an approved food ingredient in Canada, Japan and Australia. U.S. food manufacturers may use HSH while FDA reviews the petition seeking approval for its use in foods. Isomalt Isomalt is a sugar alcohol used for its sugar-like physical properties. Its glucemix index is low and it does not promote tooth decay. Like most sugar alcohols, it may cause gastric distress, including flatulence and diarrhoea, when consumed in large quantities and should not be consumed in quantities larger than about 50g per day for adults. Isomalt is a disaccharide composed of the two sugars glucose and mannitol. It is odourless, white and crystalline. 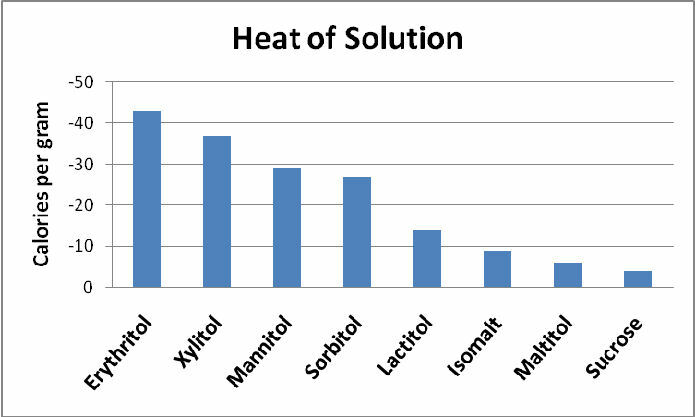 Isomalt has a low cooling effect, lower than many other sugar alcohols, particularly xylitol and erythritol. Isomalt is a natural sugar alcohol and may be produced from beets. Isomalt is manufactured in a two-stage process in which sugar is first transformed into isomaltulose and then hydrogenated, using a Raney metal catalytic converter. Isomalt has been approved for use in the United States since 1990 and in several other countries. Lactitol. Lactitol is manufactured from whey. Lactitol is a sugar alcohol used in low calorie foods with approximately 40% of the sweetness of sugar. It is used in sugar-free candies, cookies, chocolate, and ice cream. Lactitol, sorbitol, xylitol, mannitol, and maltitol are all sugar alcohols. The United States Food and Drug Administration (FDA) classifies sugar alcohols as "generally recognized as safe" (GRAS). They are approved as food additives, and are recognized as not contributing to tooth decay or causing increases in blood glucose. Lactitol is also approved for use in foods in most countries around the world. Maltitol Maltitol is a sugar alcohol with 75-90% of the sweetness of sucrose and nearly identical properties, except for browning. It is used to replace table sugar because it has fewer calories, does not promote tooth decay and has a somewhat lesser effect on blood glucose. Commercially, it is known under trade names such as Maltisorb and Maltisweet. Maltitol is made by hydrogenation of maltose obtained from starch. Its high sweetness allows it to be used without being mixed with other sweeteners, and exhibits negligible cooling effect in comparison with other sugar alcohols, and is very similar to the subtle cooling effect of sucrose. It is used especially in production of sweets: sugarless hard candies, chewing gum, chocolates, baked goods, and ice cream. Maltitol does not brown and caramelize after liquifying by exposure to intense heat. It does not promote tooth decay. It is somewhat more slowly absorbed than sucrose which makes it somewhat more suitable for people with diabetes than sucrose. In some countries it carries a mandatory warning such as Excessive consumption may have a laxative effect. In the United States, it is a Generally recognized as safe (GRAS) substance, with a recommendation of a warning about its laxative potential when consumed at levels of 100 grams per day or more. Mannitol This polyol is used as an osmotic diuretic agent and a weak renal vasodilator. It was originally isolated from the secretions of the flowering ash, called manna after their resemblance to the Biblical food, and is also be referred to as mannite and manna sugar. Mannitol is a sugar alcohol, that is, it is derived from a sugar by reduction. Aqueous solutions of mannitol are mildly acidic and sometimes such solutions are treated to raise the pH. In oral doses larger than 20 g, mannitol acts as an osmotic laxative. Mannitol is also used as a sweetener for people with diabetes. Since mannitol has a positive heat of solution, it is used as a sweetener in "breath-freshening" candies, the cooling effect contributing to the fresh feel. Sorbitol. Sorbitol is a sugar alcohol, C6H14O6 found in nature as the sweet constituent of many berries and fruits best known from Sorbus aucuparia (Rowan or European Rowan) from which it was isolated for the first time in 1872. Mid 1950s, sorbitol large scale manufacture began due to new applications, such as humectant in cosmetology and sugar substitute in non cariogenic confectionery. Sorbitol is today commercially produced from starch by enzymatic hydrolysis and catalytic hydrogenation. It has wide applications as a sweetener and humectant. Xylitol Xylitol is roughly as sweet as sucrose with only two-thirds the food energy. As with most sugar alcohols, consumption can result in bloating, diarrhea, and flatulence, although generally rather less so than other sugar alcohols like sorbitol. Xylitol was first derived from birch trees in Finland in the 20th century and was first popularised in Europe as a safe sweetener for people with diabetes that would not impact insulin levels. The largest manufacturer globally is the Danish company Danisco. Xylitol is produced by hydrogenation of xylose. Xylitol has virtually no aftertaste, and is advertised as "safe for diabetics and individuals with hyperglycemia." This tolerance is attributed to the lower impact of xylitol on a person's blood sugar, compared to that of regular sugars. Xylitol is widely used in Finland, its "home country." Many Finnish confectioneries employ xylitol, or have a xylitol version available. Virtually all chewing gum sold in Finland is sweetened with xylitol. Xylitol is a "tooth friendly" non-fermentable sugar alcohol. Xylitol-based products are allowed by the U.S. Food and Drug Administration to make the medical claim that they do not promote dental cavities. A recent study demonstrated that as a water additive for animals, xylitol was effective in reducing plaque and calculus accumulation in cats. Possessing approximately 40% less food energy, xylitol is a low-calorie alternative to table sugar. Absorbed more slowly than sugar, it does not contribute to high blood sugar levels or the resulting hyperglycemia caused by insufficient insulin response. Xylitol also has potential as a treatment for osteoporosis.